As the cannabis industry becomes legalized in new states and regions, one of the most important questions facing growers and processors is how they will fit into their local communities. We recently interviewed Shango Los, founder of the Vashon Island Marijuana Entrepreneurs Alliance (VIMEA), about the story of how one organization began the process of building bridges between medical cannabis growers and the general public on a small island community in Washington State, and how they adapted to the state’s legalization of cannabis for recreational use. One thing that has set VIMEA apart is an emphasis on the union of cannabis production and food agriculture. By supplementing their organic food production with a small crop of cannabis, farmers on Vashon Island are able to enjoy economic stability without needing to compromise environmental standards. What a great model for sustainability! Ganjapreneur: How did VIMEA get started, and when did you first get involved? Shango Los: The Vashon Island Marijuana Entrepreneurs Alliance began in the summer of 2013 in response to a growing need for a trade organization to represent cannabis growers on Vashon Island in Washington State. I am a brand strategist and business consultant and four clients in a row had come to me with legal cannabis ideas that they wanted to explore. They were all afraid of the same thing and that was being ostracized in our rural community. Indeed, Vashon Island has been growing cannabis for over forty years and it’s our island’s largest cash crop but that doesn’t mean everyone embraces it. It occurred to me that the growers could use a representative who was not a grower himself to help normalize cannabis business on the island and make a case that growers are good people and should be embraced by the community at large. Only then could we implement safe and authentic marijuana agriculture on the island. If the community did not embrace cannabis growing, then it was likely that only the fringe elements outside of the social mores of the community would move in that direction and that is exactly who we do not want running the businesses. For marijuana agriculture to be implemented in a sustainable and community enhancing way, we needed the good neighbors of the island to get involved and open the businesses. These are the folks who are already involved with their churches or kid’s schools or philanthropic organizations like Eagles or Rotary clubs and they likely already have businesses. Maybe they are not involved with any of these organizations but are just kind folks who want to keep the community healthy while also embracing cannabis. I wanted to create a space for these good folks to come out of the shadows and partner with prohibition-era growers to create a partnership that would create jobs and island revenue and good cannabis. What did you do before getting involved in the cannabis industry? I am a lifelong business strategist and entrepreneur. I participated in the first dotcom boom in California, the real estate boom in Seattle, and the space shuttle program in Colorado. In all of these places I also kept tabs on the nascent but growing cannabis industry as a fan and enthusiast. How often does VIMEA meet, and what is discussed at meetings? We meet monthly except for November when we have our harvest festival and December when we take a break for the holiday. In the early meetings, we discussed what the growers wanted out of a trade organization and how best I could be of assistance. We also came up with strategies to reach out to the non-cannabis folks on the island. Those were fun meetings filled with hope and excitement. Things got more serious though when the recreational I-502 regulations came out. When that happened the meetings became more about helping the growers and new business owners understand the Byzantine regulations that the Washington State Liquor Control Board had devised for legal marijuana in our state. I went through them line by line and interpreted them for VIMEA members who were frustrated as soon as they saw how out of whack the regulations were with the reality of the real life cannabis industry. The regulations were based on inexperience and fear and they were, and are still, a mess. In fact, the state has allowed additional layers of regulations at the county and city level too so the regulations are not uniform statewide and some cities seem have been allowed to outright ban cannabis in the face of the statewide vote. I have no doubt that those on the WSLCB were doing the best they could; they just were not the folks who should have been in charge in the first place. It has come to pass that the WSLCB members were found to have been meeting in secret and making side deals with law enforcement and other commercial entities in violation of state law. Both I-502 recreational growers and medical marijuana growers are trying to make the best of a bad situation where entrepreneurs want to make a profit and patients need medicine and the rules guiding them are a sham. After the first wave of I-502 applications were submitted to the state, VIMEA shifted gears again and the meetings became about education and skills development. I started the Vashon Island Visiting Cannabis Experts Series to bring in exceptional speakers who would normally not have come to Vashon Island. Speakers have included Dr. Michelle Sexton on cannabis as medicine, Tyler Markwart of Allele Seeds Research on growing organically without petrochemicals, Jerry Whiting of ProjectCBD and LeBlanc CNE on CBD strains and medicine ratios, new cloning techniques from Chuck Green of Clones Northwest and Reverend Cannabis taught for a great sunny afternoon about all the forms of hash processing and its history. We are very grateful to these and the other speakers for coming out to Vashon and being a part of this historic thing we are doing. 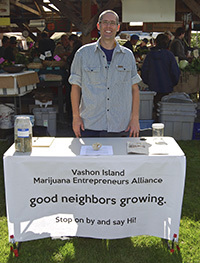 What are some examples of how VIMEA builds rapport between cannabis farmers and the general population of Vashon Island? We started with a booth at the farmer’s market and that was a great success. Folks in the community giggled a bit as they passed by and that was the first step to normalization. I got a lot of questions about the I-502 law that was passed. Some folks wanted to talk about the possibility of increased crime on the island. Mostly though, folks wanted to talk about medicine and how they could get relief from whatever was ailing them. That is where I had my first experience with a parent coming to me trying to find CBD for their child. That changed the direction I would take forever. Even though I came to the industry with a recreational mindset, the power of cannabis medicine reframed everything. We have worked with the local paper to make sure facts were being reported rather than fear. We are lucky to have a very professional and open minded editor of the paper. We placed an ad in the island’s magazine for tourists to be alongside other legal businesses too and we joined the Chamber of Commerce. We just took actions that any new trade organization would. In the end though, clearly it is the monthly meetings and creating an environment that people feel open to talking about cannabis medicine that has gained VIMEA the most respect. People get that we are here to serve. What effect would you say that VIMEA’s efforts have had on the island community? Certainly we jumpstarted the conversation on cannabis generally. We have created countless opportunities for neighbors to learn about cannabis medicine and be healed. Just by our existence we have increased the occasion of families and neighbors talking about cannabis generally around the dinner table and that is how community is made and new ideas are disseminated. I understand that VIMEA works to integrate cannabis agriculture with food agriculture. How does that work? Vashon Island takes its organic food agriculture very seriously and we do everything we can to support the family farm. The goal is to integrate legal cannabis into our organic food farms so that they can take some of the weight off the margins of the food crops. Organic farming is expensive and even more so at the small family farm size. Growing cannabis outdoors is relatively inexpensive because it relies on the sunshine instead of electricity and growing equipment. Once at market though, cannabis income far outweighs any organic food crop. Our aim is to support organic farmers to add cannabis to their organic farms so that the marijuana income can pay the mortgage and buy the new tractor and put the kids through college. It also allows the food to be grown for food and not a commodity. As a commodity we see organic produce being picked unripe so that it travels better when it actually would be more nutritious if allowed to ripen on the vine or tree or what have you. This message has been so compelling in Washington that I was invited to speak about Embracing Your Local Pot Farmer at Ignite Seattle. Because farmers think in yearlong cycles, it will take awhile for this idea to be adopted but the interest is there. Several farms have applied for recreational licenses and are forging this new path. Once those courageous folks start to show the fruits of their labor, I’m sure it will begin to catch on more nationally. For now, we are doing everything we can to make sure that Vashon Island is a good example of cannabis integration and not a bad one. What are some of the ways that marijuana entrepreneurs around the world can work to overcome negative stereotypes? “Around the world” is a big area considering all the different social mores there are. That said, the US led drug war has sculpted the world to be generally uninformed and reactionary to pro-cannabis policy. This may seem remedial but the first thing I’d recommend is to be vocal about your affiliation with cannabis and then just be nice to people. Every sub-culture is judged primarily by peoples’ impressions of them. If you say you are in the marijuana industry and then act like a jerk, you become a poor representative for the whole industry. On the other hand, if you are kind and not angry, you become a positive representative of the industry. You can get everything you want and more out of this world while being kind, even in conflict. Being a jerk serves no one and makes your own life harder. In addition to that though, organize. If cannabis folks come together to try and get on the same message, we speak with one voice. There are so many competing opinions amongst us in the cannabis community and that is good. However, many of us need to be educated with the latest understanding of the plant and how to grow it, medicine and public policy options. Only sitting at home and getting high will not help coalesce the movement. Get out and go to a meeting. You are sure to learn something, you will likely make some new friends, and you will be participating in helping us all row the boat in the same direction. In Seattle, for example, I try and attend meetings for the Coalition for Cannabis Standards and Ethics. It is a group of growers, patients, health care providers, entrepreneurs and others who all want the industry to evolve in ways that are ethical and respect patients’ needs while also allowing for commercial success. At the meetings I am able to trade perspectives with my peers and share learning. The CCSE brings in great speakers that teach us all at once. This kind of information dissemination is vital for the cannabis movement. Also, it is reassuring to spend time with other cannabis professionals who are experiencing the same challenges that I am. We can share best practices and learn from each others’ mistakes. Getting organized is key projecting a good image as a whole industry. There is currently a lot of turmoil surrounding the recreational and medical markets in Washington. What do you think the future of legalization in the Evergreen State looks like? Gosh, that is a difficult question without a crystal ball. The market is such a mess and the industry is evolving and expanding at such a rate that anyone who says that know what is going to happen for sure is fooling themselves. There are risk percentages, hunches and sheer guesses, but no one knows for certain. There are too many variables. That said, the medical market and the recreation market will end up merging eventually, I suspect. I hope it does not happen this legislative session for sure though because the recreational market is nowhere ready to meet the needs of patients. If you go into a recreation store there is little CBD on the shelves. The flowers that are there are often rushed to market without a proper cure. Of course, the price is too high as well, for now. In the end, it makes sense for one sales channel to sell to the entire market though. The challenge is that the WSLCB is rushing the integration at the behest of I-502 business owners. I respect the needs of the I-502 folks as they are my friends and clients and I’ll likely have my own down the line too. That said, the needs of the patients outweigh the financial interests of the I-502 folks in my eyes. Entrepreneurs choose to take on this market risk in exchange for profits and over the long term they will be exceptionally profitable. Patients have not made that choice. They are just trying to relieve suffering. Certainly there is money being made in medical marijuana but until there is a real replacement found in the I-502 system the first priority is to not neglect patients. The best thing that can happen right now is for I-502 producers to quickly add substantial amounts of CBD to their operations and the WSLCB to allow the retailers to begin to discuss cannabis as medicine at the retail level. Right now the budtenders cannot even mention that cannabis can provide relief and that is absurd. With all of this VIMEA volunteer work, where are you able to actually make your own overhead? Because my role in the cannabis community is to connect with people and help them succeed, for-profit cannabis businesses seek me out. Many entrepreneurs know how to run a business but do not know cannabis. Many prohibition-era growers know cannabis but not how to build out a legal, sustainable company. I am grateful to have both sets of skills and can create a bridge. I help companies develop their business strategy and write their business plans. I understand regulatory structure and how to lobby rulemakers. I help clients through product development, packaging and brand strategy. Companies hire me as a consultant to help them smooth out the rocky road of cannabis start-ups. VIMEA is an organization that I founded so that cannabis is integrated on my island home in a way that preserves the character of the island. There are plenty of other places to make money in cannabis. What advice can you give to growers who want to create an organization such as VIMEA to represent their community? Don’t get into it for the money. This is a service role in your cannabis community. If you are in it for the money you become a competitor for your members. Putting together a trade organization is about helping others win. By their success, you will win too. You can get everything you want by helping others get what they want, as Zig Ziglar says. Find an inexpensive location to meet and keep your overhead very low. If you are going to exist off donations, you have got to know you can float the cost of the space if the donations are light at that particular meeting. Also, it does you no good to be worried about overhead while you are trying to be selfless and help your grower members sort out their regulatory issues. Reach out to your local paper right away and tell them what you are up to in the best way possible. This will hopefully decrease the likelihood of negative press which is very difficult to dig out of. Don’t try to do it all alone. Let volunteers help you greet people and set up and tear down at meetings. Let volunteers help make decisions too. It will make your members feel more invested in the strength of the organization if they really feel like they are a part of the solution and the power of any community is that it has many voices. Thank you, Shango, for sharing your experience! We look forward to seeing more grassroots organizing among cannabis entrepreneurs as the industry grows.